If you tend to suffer with tonsillitis after a cold, or each winter, you may wonder why you have tonsils in the first place. Are they like the appendix, vestigial structures that now causes us more harm than good? The evidence is that tonsils are not in the same league as the appendix. Tonsils are an active part of the immune system and when they become enlarged and swollen, often it’s because they are doing the job they are supposed to do. 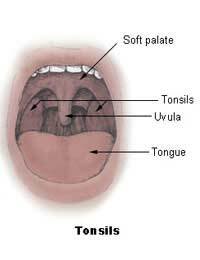 Tonsils are glands, tissues that contain a concentration of immune cells. The tonsils are at the back of the throat and so are ideally placed to trap and deal with infectious agents that are breathed in – usually bacteria and viruses. Tonsils contain lymphatic tissue, which is basically the white cells that carry out the function of the immune system, trapped in a fibrous net. When bacteria or viruses infect the lymphatic tissue, they are taken into the white blood cells, which then prime the rest of the immune system to fight off the infection. Without this important first barrier to help fight off bacteria and viruses that are breathed in, the body is open to a lot more infections deep inside the lungs or inside other parts of the body. If the tonsils become swollen, that is not as bad as the lungs becoming inflamed. Healthy tonsils that work well help us to resist infections and to get better quicker when we do get a cold or a cough. Tonsils are relatively easy to remove as they are so visible at the back of the throat. They can get very sore if you get a lot of infections and, after World War II, doctors started taking tonsils out as a matter of course. They thought that by taking the tonsils out, they would be preventing a lot of problems with infections. Now, research has shown that only a few people actually need to have their tonsils removed. If you are troubled with regular tonsillitis, and you never seem to recover, or your tonsils become so swollen that they start to affect your breathing, a tonsillectomy is still considered the best option. If you can hang on to your tonsils after your teenage years, you will probably find that they become less troublesome. Tonsils are more active in childhood and they tend to shrink as we become adults. What are Bad Reasons for Having Tonsils Out? Your parents or grandparents may have had their tonsils out and urge you to have the same operation, but following family advice is not a good enough reason for a tonsillectomy. Nor is the idea that you can avoid tonsillitis if you have never had it. You may get it at some point, but isolated infections are not a good reason for a tonsillectomy. You may consider an operation to remove your tonsils if you have bad breath but it is wise to check out what else could be causing this before going to such drastic lengths. If you do need your tonsils out, the operation to remove the tonsils is a routine surgical procedure that usually only involves one night in hospital. A general anaesthetic is usually necessary and the surgeon operates through the mouth, using a very sharp and specially shaped blade to remove each tonsil. It is important to limit the bleeding and stitches that later dissolve are used to close the incision. Other techniques are also used today – including lasers, ultrasound and diathermy. This cuts away the tonsils using heat generated by an electric current and has the advantage that the heat seals the blood vessels as the incision is made, reducing blood loss to a minimum. After you have your tonsils removed, your throat is quite sore. Over the counter pain relief is normal to help the pain and you will probably get a course of antibiotics. It’s a good idea not to go out and risk catching an infection just after your tonsils have been removed, so that your immune system has chance to build up its reserves without the tonsils.